The site of Gurob lies on the western end of the desert south of Lahun, Egypt, on the eastern edge of the Fayyum (see the Google Earth view at the left; hover over to enlarge). Its large cemetery spans all of ancient Egypt's history and was first partially excavated by Sir Flinders Petrie in the 1880s. In 1920, he sent two of his assistants, Guy Brunton and Reginald Engleback, back to the site for further investigations of the tombs. 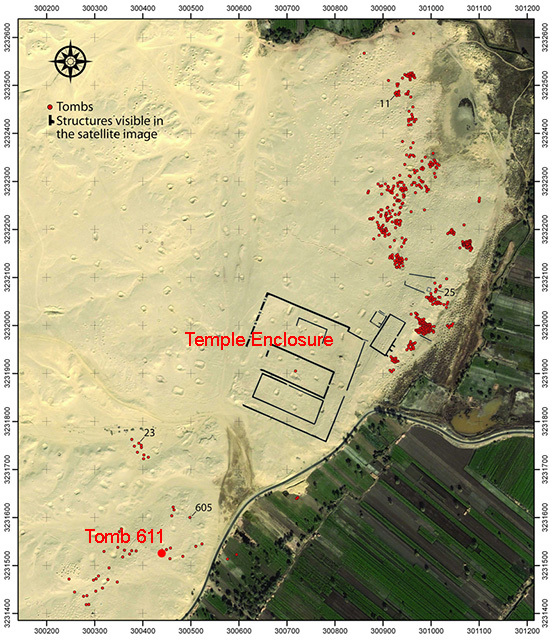 Tomb 611 (a shallow shaft with a chamber at the west, according to Petrie's report) is located near the southeastern edge of the cemetery in a cluster of other tombs south of the "Harem" structure (see the location on the satellite image at the left; hover over to enlarge). Among the meager remains found in the small tomb were pieces of hair and dozens of fragments of a small painted wooden boat. Petrie interpreted the boat as a child's toy (mainly due to the wheels found among the fragments of hull, oars, and stanchions) and dated it to c.1000 BCE. Based on radiocarbon tests, it can now be more precisely dated to the 19th or 20th Dynasties (c.1300-1100 BCE). The fragile fragments of the little model boat are currently stored in a drawer in the Petrie Museum of Egyptian Archaeology, London (#UC16044). There is very little by way of documentation about the tomb or the boat other than a brief description and reconstruction drawing in Petrie's excavation report and a few subsequent mentions in assorted publications. The importance of this small boat was recognized by Shelley Wachsmann (Texas A&M University) who was struck by several intriguing features of the model and its findspot. Normally during the New Kingdom in ancient Egypt, ship models are found only in royal tombs and Tomb 611 was clearly not of that nature. Further, this was not a model of a royal ship. Wachsmann noted that the shape of the vessel most closely mirrors that of galleys depicted both in Late Bronze Age Greek pottery and on New Kingdom wall decorations in Egypt (in the latter case, of the so-called Sea People ships). Since all those depictions are monochrome, the color on the Gurob boat offers an intriguing insight into ancient painting preferences. Further, Wachsmann notes that the model bears a typical Helladic bird-head decoration topping the stempost while holes along the top of the hull indicate the possible use of stanchions, especially when compared to similar carved and painted representations. 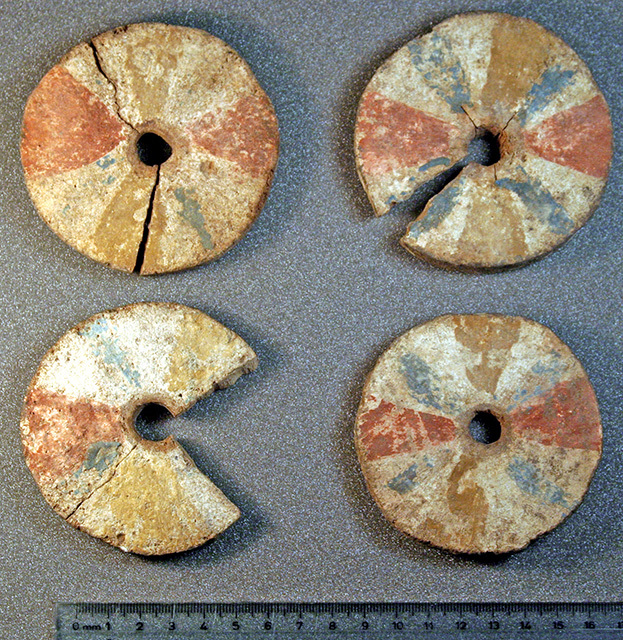 Among the fragments were four wheels (see the photo at the left; image © Shelley Wachsmann, used with permission; hover over to enlarge) and other pieces that might indicate a wagon-like support structure, which tantalizingly suggest European prototypes. Ancient textual evidence for the Sherden living in and around Gurob could suggest that the ship model represents a galley of that Sea People. That the little model may represent a Sea Peoples ship offers a unique glimpse into the watercraft used by these elusive travelers who seemed to have disrupted shipping and governments during the end of the Bronze Age (c.1200 BCE). 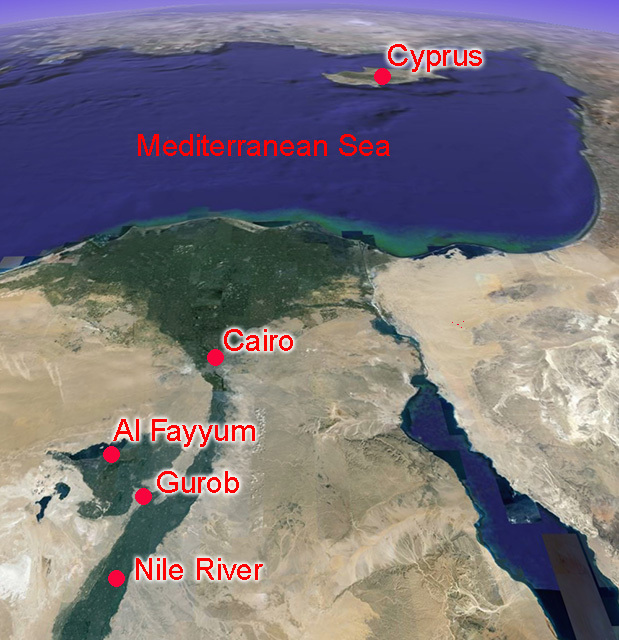 Further research by Wachsmann has demonstrated a conenction with ancient Greek religious rituals and their links to Egypt as well as insight into ancient seafaring. As his research began, Wachsmann called upon our sister organization, the Institute for the Visualization of History, to help him investigate the model more completely, test various theories about its original form and color, try to understand how all the many little pieces might have originally been attached or otherwise used, and provide other researchers with a new ability to examine this remarkable artifact (a substantial digital supplement including interactive 3D models created by us for the Institute were designed from the outset as integral parts of Wachsmann's final publication--The Gurob Ship-Cart Model and Its Mediterranean Context). with the many pieces and possible configurations while trying to determine the original form of the vessel. Also, since the object is stored in a museum quite distant from Wachsmann's university, obtaining repeated permissions and constantly traveling to view the pieces and ponder the uses of its various supplemental fragments was out of the question (photos of some of the Gurob fragments at the left; photographs © Shelley Wachsmann, used with permission; hover over to enlarge). The methods and techniques of virtual heritage allow us to investigate and change things in ways not possible or not practical in the real world. The constant back-and-forth dialogue between Wachsmann and us throughout the various phases of the 3D modeling process yielded an efficient and effective means of evaluation. We began by examining the high-resolution photographs, drawings, and detailed descriptions and dimensions of the excavated pieces provided to us by Wachsmann and the museum. These data formed the basis for the as-found 3D model of the ancient ship (see various views rendered at the left; hover over to enlarge). From the basic as-found model, we could output the files for viewing in virtual reality (VR) which would allow Wachsmann (and colleagues) to examine the ship as though holding a single object in their hands (see the VR as-excavated model at the left). The VR version allowed nuances of the object to be examined close up (without damage to the original wooden pieces); it can be rotated in any direction; and the ship could be viewed from all angles to compare against photos, providing an exciting and effective way to study ancient objects (use your mouse, touchpad, or trackball to zoom, rotate, and inspect the ship). Next, we worked on the form and colors of the little wooden model as originally carved using what we had learned about the various features from building the virtual as-excavated version. Wachsmann s research into ancient ships of the period helped fill the gaps and provided plausible evidence for various details. After we modeled the basic vessel, we began testing how the remaining loose pieces (such as the stanchions, quarter rudder, and oars) might have fit into the original design (renderings from the virtual reality models of two versions is at the left; hover over to enlarge). Additional programming on top of the VR model provided Wachsmann with moveable virtual parts so he could test how changing their positions might affect the look of the ship (you can play with reshaping the 3D model in the virtual reality reconstruction at the left; click on the 'Open Controls" button to pull down a set of sliders; place your cursor in one of the slider boxes adjancent to the category and slide to move the selected item). Different iterations could be compared to the varying ancient depictions to see which configuration most closely matched a majority of representations. Some features of the ship (such as the angle of the steering oar) could be more definitively aligned based on traces of surviving paint, which seemed to indicate how those pieces were originally attached. After we had a good working model of the as-built original, we could add elements that would have most likely been part of the original design, but that did not survive. 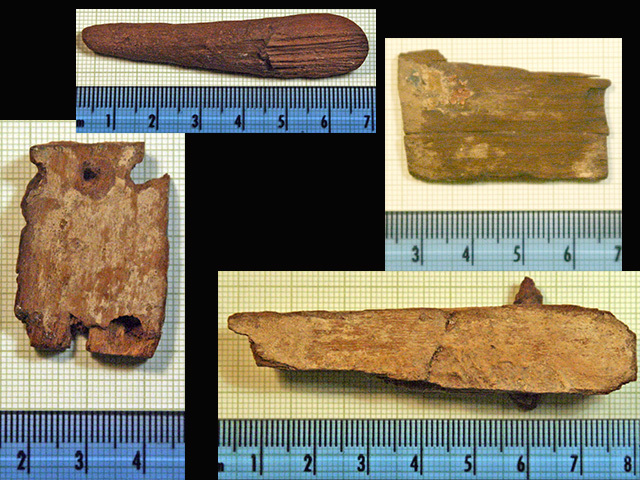 Clues found on the existing pieces suggested possible locations for these missing elements; for example, remnants of paint along the hull allowed us to complete the oar ports and black paint on the lower portion of the hull. We chose a translucent neutral toned shade to indicate the hypothetical areas for which there are no surviving fragments. could not be used as fenders as they would interfere with the quarter rudder. These details would have most likely gone undetected without testing the all the various options via real-time computer graphics. Also, we discovered, through experimenting with wheel placement, that the wheels have slightly different diameters. They could not be placed randomly, as certain arrangements caused the ship model to tip oddly. This peculiarity was discovered only upon rotating the model in virtual reality and inspecting it from various viewpoints. The differences in the wheels sizes were not appreciated until that point, but clearly reflect where each wheel was originally placed. None of these issues or their eventual resolutions would have become evident working only with the pieces individually or by drawing their presumed configurations. Thus, working through the reconstruction process using interactive 3D computer models demonstrated that many aspects of the original design could not have been fully appreciated through traditional analytical methods or simply by eye alone. 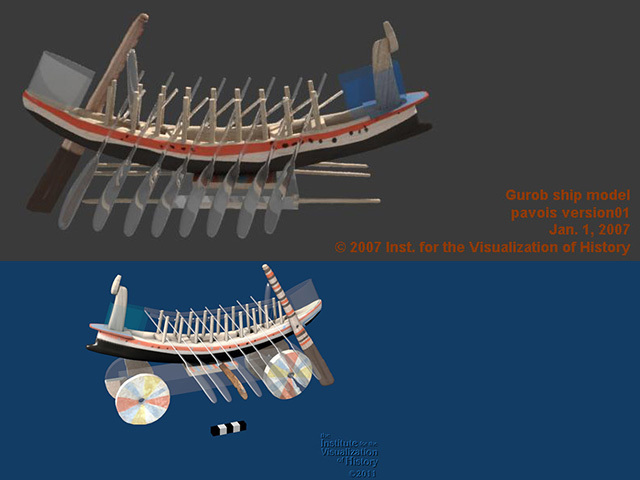 Despite the small size of the Gurob ship model, the use of interactive 3D computer graphics technologies provided Wachsmann with new insights and new opportunities for understanding and investigating the object and its many pieces. 1927 Gurob. London: British School of Archaeology in Egypt and Bernard Quaritch. 1933 "Egyptian Shipping: outlines and notes," Ancient Egypt and the East parts I-IV, Mar-June & Sept.-Dec.: 1-14, 74. 2018 "Egyptian Ship Model Sheds Light on Bronze Age Warfare and Religion," The Iris: behind the scenes at the Getty, July 9 blog. 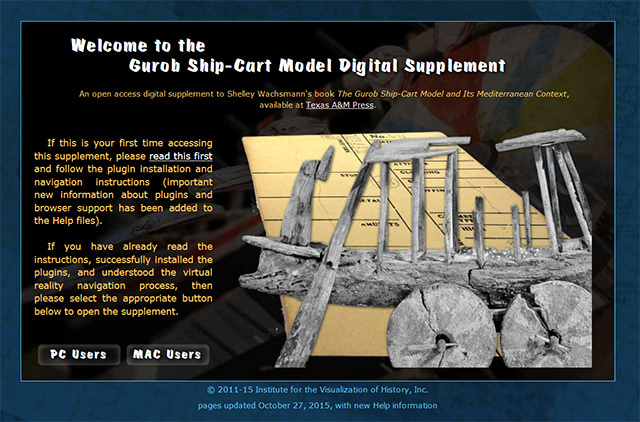 2013 The Gurob Ship-Cart Model and its Mediterranean Context, College Station, Texas: Texas A&M University Press (joint winner of the 2013 Nautical Archaeology Society's Keith Muckelroy Award). © 2017-2019 Learning Sites, Inc.